Corcoran Environmental Services from its conception was committed in offering a level of performance that was noticeably different for our competitors. Working day to day with the professionals in the municipal and commercial markets has been rewarding, while continuing to strive to bring a timely and effective quality to our work. We sincerely appreciate all of our customers now, and the ones that will come in the future. Corcoran Environmental Services is please to present a few letters, out of the many we have received over the years, which confirms our efforts and commitment to our customers. Corcoran Environmental is the waste and recyclables service provider for the P&G Plant in Auburn, Maine. They have provided exceptional service and value for us. They are very responsive to our needs. They are proactive in finding solutions for our waste and recycle streams. They were instrumental in developing a solution that allowed us to become a zero land fill site. All of our waste either goes to recycle or is converted to energy as a beneficial reuse. I have worked with many other companies in my 12 years in purchasing for Procter & Gamble. 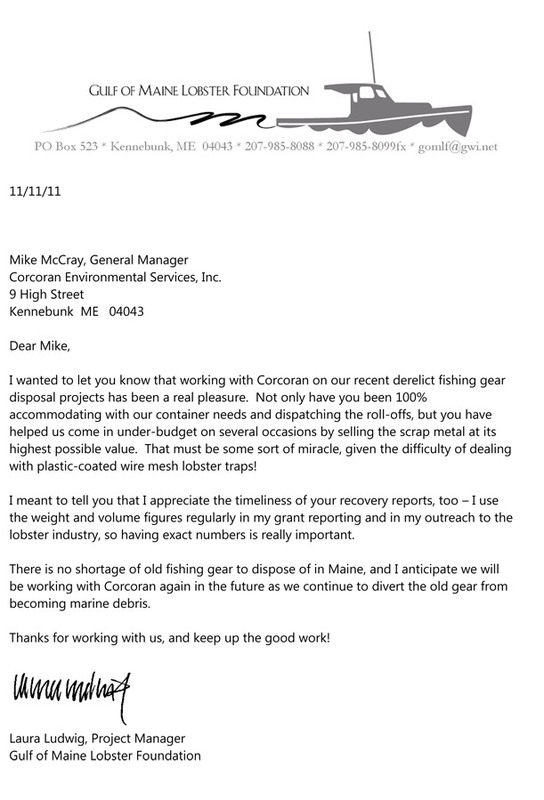 Corcoran Environmental is the most proactive service provider I have worked with. When I call with a new request or need, I am never told that they can't help. They are always willing to look into it and work to find a solution. They have accomplished this while also cutting our costs for waste and recycle disposal and handling. "This is a recommendation for Patrick Corcoran and Corcoran Environmental Services, Inc. The Poland Spring plant in Hollis Maine has been working with Corcoran Environmental Services for nearly to three years. We started working with Patrick on the purchase of boxes that could be sold for reuse. In 2004 we went out to bid on our recycling not only in our Hollis facility, but a sister facility in Poland Spring and a warehouse in Seabrook, NH. All the facilities were familiar with Corcoran Environmental Services due to their assisting in meeting needs that another recycler could not meet. We signed a regional agreement with Corcoran, who was the most competitive. Since then, I have not had a single complaint from any of the facilities in regards to service, or compensation. In addition, we are working with Corcoran on a regional brochure that will explain our recycling (an effort that has been lead largely by Corcoran), and we continue to look at ways in which we can improve recycling."